Our last full day in Cagayan de Oro started early again, as usual. Since our bodies are not adjusted to being 13 hours in the future, we tired easily during the day when we would be sleeping at home. And it's easy to wake up early. Patrick woke up sometime after 3:00AM and started reading his Bible with his flashlight. I had my alarm set for 6:00AM but woke up again around 5:00AM without the alarm. We got together with the brothers for a time of devotion before breakfast. We worshipped the Lord together with song and then we asked each one of them to share something from the Lord. Patrick started us out with the Gospel account of "casting your nets on the other side of the ship". He shared with the brothers that at times we will be tired but the Lord will ask us to try "again". He also shared that we can call on others to help, just as the disciples did, and they can help us through prayer and other ways. It was very a appropriate beginning. Then each brother in turn shared some scriptural insights and I wrapped it up before we spent a time in prayer together and headed down for breakfast. All three of these brothers are pastors and it was enjoyable to hear them share from God's word. Then it was off to town to finalize the purchase of the video projectors, pick up the screens that we had made and finish up some odds and ends. We rode Jeepneys all day expect for once we rode a tricycle, at my request. Once was enough! 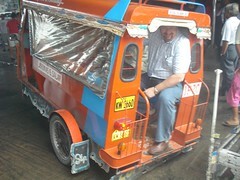 I just thought the Jeepneys were tough for a big boy to get in and out of ... the trikes are much smaller. They are essentially a miniature Jeepney powered by a motorcycle. The cost is the same for Jeepney and tricycle, 6 pesos (about 15 cents per person per ride). Patrick took of picture as I was about to get out. I promise my weight didn't make it look like it was doing wheelies ... they're built that way. Honest! :) After riding in both tricycle and Jeepneys, I'll take the Jeepney any time! After we finally got through ordering the equipment, picking up the screens, purchasing foam for the suitcases, etc, we headed back to the hotel for some training. It's amazing how long it takes to get things down here. There's no Walmart or Radio Shack so you have to go to different places to get different things. One example is we couldn't find any pre-made extension cords anywhere. So we had to purchase the wiring and plugs to make up ourselves. We'll be purchasing small generators for the brothers in the more remote areas, and they'll need longer extension cords to get the projector and sound equipment away from the sound the generator will make. 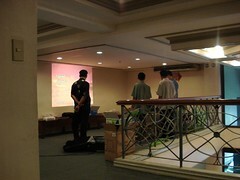 After receiving permission from the management, Patrick and the brothers set up the equipment in the mezzanine level above the lobby while I came down to write this blog and upload some pictures. I've uploaded 33 more pictures to my Flickr account which you can view normally or as a slideshow. I put comments on all of them so hopefully they'll sort of walk you through our day. We will be meeting for supper in just a bit and will finalize several things with the brothers this evening, among them is selecting a national coordinator. 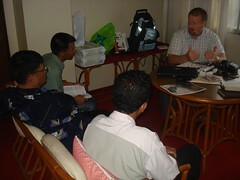 We will also have a time of commissioning - laying hands on them and praying for them as well as for the equipment. They also will sign a contract that specifies their understanding of their duties and responsibilities towards CSC and that they will not use the equipment for any other purpose than for film evangelism. As we were walking back to the hotel this afternoon I took a lot of pictures of different people. But there was one picture that just stood out to me. 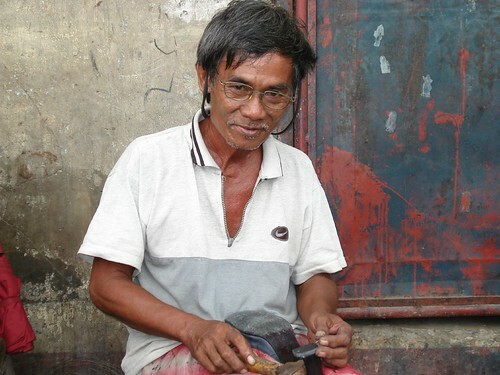 And old cobbler was set up on the sidewalk, working on old shoes. I asked him if I could take his picture and he nodded yes. I respectfully took his picture as he looked up with his tools in his hands. The weathered look about his face, the toussled hair, the worn hands holding aged tools spoke to my heart. It's like in this one picture was the call of the whole nation, saying, "Will someone give me some good news?" Thank you guys so much for making this trip possible, for supporting us with your prayers, for believing in the ministry of Christians Sharing Christ. Because of you, over 80,000 men, women and children like this man accepted Jesus as Lord and Savior in over a dozen countries around the world. And because of you, many more will come to saving faith in Jesus in the Pilippines, Nepal, Pakistan and India. And as a good friend of mine often says, "That's what it's all about." Thank you, thank you, thank you!!! Also found out that Nepal was to have Constituent elections this past June. Our prayers continue for you and Patrick. May the Lord give you many divine appointments. May He keep His covering angels around you. And may He open your eyes to see what He is doing in that nation. Thanks again for the updates and the pictures. This is a wonderful way to keep everyone on the same page of your mission's journey. Like I said before, I sure wish there was another word besides 'pride' to express how I feel about the work you and Patrick and Christians Sharing Christ are doing. I remain ever grateful that Christian Challenge was given the opportunity to link up with such a viable 'soul-winning' ministry arm for the Lord. You can be sure that many prayers remain before the throne of God for your continued success. Your mom and I send our love which certainly includes our love for Patrick and for both your families. 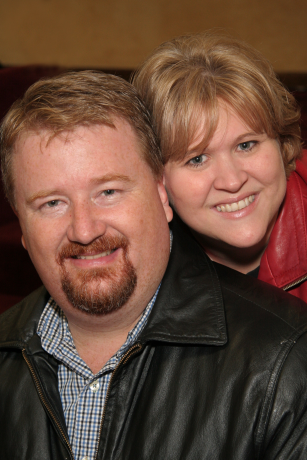 Life Church will be praying for you guys while you are in Nepal. I am enjoying being able to keep up with your blog and the highlights of your trip. Be safe! Thanks for the comment. I do hope you and Mom can come to the Philippines. I know it would be a fulfilment of a desire for you. And I really think Mom would enjoy it. Manila is beautiful and very modern, yet with the charm of the tropics. And since just about everyone speaks English, it's easy to get around and do stuff. I saw your email from the brother from Pakistan. I will check them out and have our Pakistani brothers check them out as well. It's good to have local people who can check out some of these invitations to ministry that we receive. We're about to head out for Nepal. It will be another long day of travel ... first to Manila, then to Hong Kong, then to Kathmandu, Nepal, arrivng about 17 hours from now. But it will be a good day! I love you guys! Thanks for your love, encouragement and support! Great to hear from you, as always. I really appreciate the prayer cover. You know what it's like to be away and need the prayer cover. Thanks for the encouragement and for being my friend.